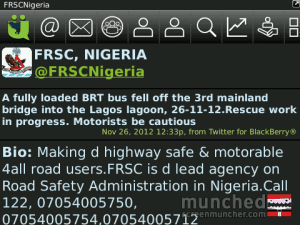 The Federal Road Safety Commission has just stated through its Twitter handle @FRSCNigeria that a fully loaded BRT bus just fell off the Third Mainland Bridge into the Lagos lagoon. The bus was “fully loaded with passengers”, according to reports. the is a need for sensitization and orientation. who are we to belive?